Imagine a community of almost 1200 people, of many genders, of many colors, many ages, from 94 countries worldwide. Imagine this community to convene at a wonderful site in one of the largest cities in the world, in the population-wise second-largest country and subcontinent of India. A country living in tradition and modernity at the same time, where dehumanizing poverty and perverse wealth collide on a daily basis, where women are struggling for equal rights and human treatment, supported by a growing number of men. Just like five years ago at the first MenEngage Global Symposium in Rio de Janeiro, this year’s symposium felt like a sort of homecoming. A growing community of realistic idealists and idealistic realists for whom engaging boys and men in gender justice is the most normal thing in the world, mainstream, no doubt about it! This is where I belong, this is my community, this is my sangha. To be part of and held by this community of wonderful wise and loving ambitious and people is one of the best things that can happen to me. I feel elated, nourished, inspired and strengthened to continue doing my work, knowing I’m not alone, we’re not a few, we are a lot and we are growing. Even just to start giving an impression of the program seems useless; for an individual, it was only possible to slide through the symposium by taking one step at a time, one session after another, using the breaks for talking with so many interesting people and visiting the stands and poster presentations of so many great organizations and projects. I guess I’ll have to put a slide show somewhere online to give you an impression. Here it is! Register for updates if you’re interested in more like this. Clearly, some things stood out in the program. 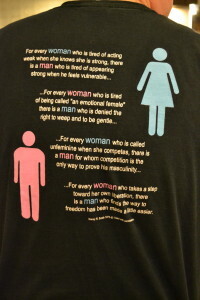 MenEngage’s relation with the women’s movement has been a recurring and important topic. 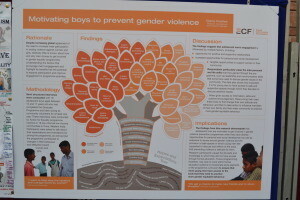 How to ensure that working with boys and men continues contributing to women’s rights? How te be accountable to the women’s movement? How to share and enlarge resources rather than competing for them? Joni van de Sand, the new global co-coordinator for MenEngage, pointed out that more than half of the registered participants have ticked the bos ‘women’s rights organization’ when asked for their background or constituency. Thus, her conclusion: we are strongly connected to the women’s rights movement already! 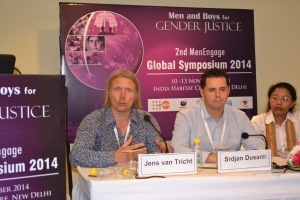 At the closing session of the symposium, Gary Barker, the co-chair of MenEngage, shared that he heard the Delhi Declaration and Call to Action being criticized both by someone complaining that there was too much talk of ‘men’s vulnerabilities’, and by someone else complaining that there was too much talk of ‘women’s rights’. 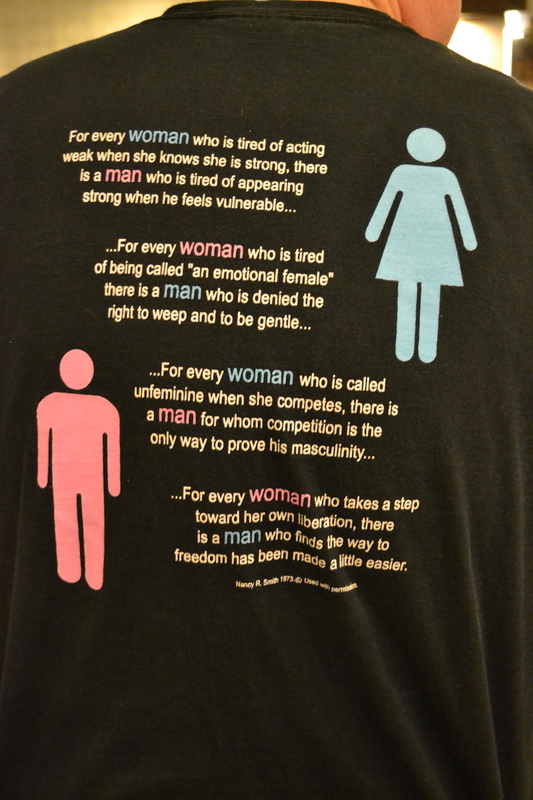 This clearly sets the challenge: how to reconcile men’s vulnerabilities with women’s rights? In my opinion, the symposium did a great job. Yes, there was more attention for men as victims, of violence, of poverty, of racism. And at the same time the ongoing gratitude towards, support to and cooperation with the women’s movement was a strong thread throughout the program. Of course, we would like to do even more, at all levels. Our work is not done yet, not at all! 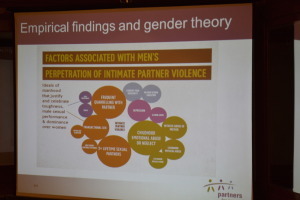 Of course, both men’s care and men’s violence were key topics in the program and in most people’s work. They are two ends of a continuum: caring men will be less likely to use violence. However, as someone remarked: ‘we wouldn’t want men to love their children and hate Pakistan’. So besides promoting caring masculinities, it is important to look at the roots of violence, the ways societies are structured in order to train men as potential users of violence – because societies think they need violence to protect them. After which these same societies need protection from the violent men they have created. How come many boys are used to holding and shooting guns even before they learn to read and write? Reverse development would be a topic to work on, in order to reverse the still somehow neocolonial dynamic that sometimes seem to be at play in international development. Like in The Netherlands, where the public and policy opinion sometimes seems to be that only migrants and people of color still need to work on gender equality, on the global playing field it sometimes seems like the rich and white countries are predominantly working on gender transformation in poor and colored countries in the global south. In my opinion, all these wonderful programs being developed in the global south could be of help for us in Europe, in The Netherlands. Please come and share your lessons with us, present us a mirror of our behavior, guide us to transformation of masculinity and femininity, let us reflect on and redefine our communities. So now I will have to live as an exile to my community again, for probably another 5 years. I know parts of my tribe are around here, we will have gatherings, we will celebrate our growing community, we will make the community grow by connecting with others again. There is the European Regional MenEngage Network, we have a yearly meeting. We are strengthening the networks in The Netherlands. And I know where I belong, I know we are in this together. I know even you are with us. Thank you!